The authorities in Bangladesh, yesterday, shifted the Interim Editor of Daily Amar Desh, Mr. Mahmudur Rahman, to the Bangabandhu Sheikh Muzib Medical University (BMSSU). Rahman is detained at the Kashimpur Central Jail since 17 April 2013. The court had allowed Rahman to be detained in police remand for six days, before the police handed him over to judicial remand. It is reported that Rahman had to be shifted to the hospital since he is suffering from flesh wounds, allegedly inflicted upon him by torture in police custody. Rahman has been reportedly fasting in custody in protest against his illegal detention, torture, the arrest of his colleagues as well as the illegal closure of Daily Amar Desh. 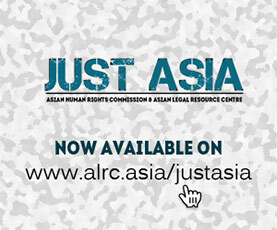 Since Rahman’s arrest on 11 April 2013, the Asian Human Rights Commission (AHRC) has been calling upon national as well as international civil society organisations to intervene in this case, to ensure that Rahman is not tortured in custody. The AHRC has written to the Inspector General of Police in Bangladesh, seeking the officer’s supervision to ensure that Rahman is not tortured in custody. The AHRC also wrote to, Mr. Frank La Rue, the UN Special Rapporteur on the promotion and protection of the right to freedom of opinion and expression to ensure that Rahman will not be physically hurt in custody and that the government follows its constitutional as well as procedural mandate while undertaking the investigation of charges leveled against Rahman. The AHRC is informed that Rahman was tortured in custody and that from torture, he has suffered serious injuries. It is reported that the torture happened on the second day of Rahman’s police custody. Eyewitnesses allege that Rahman has numerous injuries on both of his legs. It is reported that some of the injuries appear as if they are caused with iron nails and from contact with electricity. Additionally, it is reported that Rahman is also suffering from a heart condition that requires immediate intensive medical attention failing which he may die. Since 11 April, the government has sealed and closed the printing press of the Amardesh Publications. Rahman is arrested on three separate charges. The first case, of sedition, is lodged by a prosecutor of the “International Crimes Tribunal” (ICT) at the Tejgaon Police Station in Dhaka, accusing Rahman for reproducing a Skype conversation between a Judge of the ICT and a person living abroad concerning an ongoing trial. The Tejgaon police, accusing Rahman, that he destroyed vehicles on the road, lodged the second case. Interestingly, Rahman was in police custody, on the day he was accused of having destroyed property. The third case against Rahman is accusing him, of having published an unverified letter along with a photograph. It is trite to argue that none of these charges stands a chance in a trial, if the trial is impartial. The police’s forced closure of the printing press of Daily Amar Desh, is arbitrary. There has been no court case or order from any court in the country directing the police to close down the press. To ensure publication of the daily, the Interim Chairperson of the Amardesh Publication Limited, Mrs. Mahmuda Begum, made an alternative arrangement to print the newspaper at the Al-Falah Printing Press. However, a District Magistrate — an executive officer and not a judicial magistrate — prohibited the printing, prompting the police to arrest 19 workers of the press. The police also registered a case against Mahmuda Begum and the editor and publisher of the Daily Sangram, yet another newspaper of the Bangladesh Jamaat-E-Islami party. Rahman, whilst custody, went on a hunger strike to protest the closure of the press; demanding immediate release of the 19 persons arrested for helping Daily Amar Desh to print; and against registering the case against Mahmuda Begum. Due to this, Rahman’s health further deteriorated. Rahman has reportedly informed his lawyers and colleagues that the Detective Branch of the Dhaka Metropolitan Police has tortured him in custody. The lawyers and those who were present in court, when Rahman was produced in court, claim that he was finding it difficult to sit in court and that Rahman had fresh flesh wounds on his legs. His dress was reportedly bloodstained. On 18 April, a writ petition was filed at a High Court Bench challenging the order of sending Rahman in police remand. Rahman’s lawyers allege that placing Rahman in police remand without adequate measures in place to ensure the detainee’s physical health, violates the High Court’s directives concerning under trial detention. According to the High Court’s directives, every detainee has a right to be examined by a qualified medical practitioner prior to remand custody and for regular medical examinations, periodically, during the entire period of detention. The person is also entitled for a medical examination, before release. The understandable rationale of this directive is for the court to ensure the physical safety of a detainee and to prevent torture in custody. None of this was followed in Rahman’s case. When this was brought to the attention of the court, the Attorney General of Bangladesh, Mr. Mahbubey Alam, objected the submissions, alleging that the High Court’s directives are not applicable in this case. In fact, the government had earlier filed an appeal against the order of the High Court Division concerning medical examination of detainees to the Appellate Division, which was dismissed by the Appellate Division. However, in Rahman’s case, the High Court Division chose to ignore its own jurisprudence, once again affirming Rahman’s allegation, which he made when he was produced first in court, that the judiciary in Bangladesh is acting as directed by the government and that it is no more independent. The AHRC therefore wishes to recall its earlier statements regarding the vindictive arrest and arbitrary detention of Rahman. The AHRC once again wishes to urge domestic and international civil society groups, as well as the UN Special Rapporteurs on the promotion and protection of the right to freedom of opinion and expression; and on torture and other cruel, inhuman, or degrading treatment or punishment to intervene in this case.